7.28 points at 25 votes (rank 267). Mikie wants to deliver a message to his girlfriend at school. This is of course not as easy as you might imagine. Our hero sets off to his beloved through the different rooms of the school (class room, hall, locker room, cantine, gym, schoolyard). His teacher (who does not even shrink from using his fake teeth as weapon), the janitor, a school cook, dancing girls, as well as some players from the school team try to put him off from his mission. The game is shown in a three-dimensional view. The graphics are well elaborated and the animations are fluent. 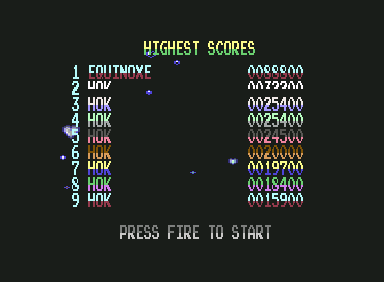 Each level is displayed in a single screen and has its own title tune. One of those tunes is 'A Hard Day's Night' which of course is a fine earworm for the game. Your character is controlled with the joystick. e.g. : You can push your classmates from the chair by standing left or right next to it, then pressing the fire button and moving the joystick to left/right at the same time. You need to move Mikie through the school and collect all hearts in each level. Each collected heart puts a letter in the field which is shown at the upper rim of the screen. When the message is complete, you can leave the room and get into the next level. For this you lead Mikie through the door which is marked with "OUT". Now you are in the school's hall and have to find the correct entrance to the next room which is marked with "IN". Single heart, which is under the chairs. Pick up with pressing the fire button once (SHOUT) or by walking over them in the hall. Triple heart, which finds itself in the changing rooms or on the tables. Stand in front of the heart and press the fire button three times. Mikie has to pick up the hearts, which are under the seats of his classmates. At the same time the teacher tries to keep him from doing so. The teacher is partially so frustrated that he throws his set of teeth after Mikie. You can also make a small break by sitting on a chair - but not for too long. If the teacher or his false teeth get you, you will lose a life. When you have fulfilled your task, you leave the room and go into the hall of the school, in which you find many doors. The door to the next level is marked with an „IN“. Behind the other doors you can find either female school fellows (bonus points) or annoyed teachers. Also, our hero must beware of his teacher that went after him and the janitor. You have to collect each three hearts which are in the lockers. For this you stand in front of the lockers and pick up each heart indivdually by pressing the fire button (SHOUT). Mikie can pick up a basket ball from the boxes and with this detain his pursuers a bit. After the changing room you go again to the hall and into another room. Mikie must pick up the hearts that are scattered in the whole room and also the one which is on the table. You are again chased by your teacher, the janitor and the school cook. Again, you can keep them a bit away by throwing chicken at them. Here also collect the hearts and try to keep distance from the dancing girls. If the girls make it to kiss you, you will be dizzy for a moment and if will be easier for your teacher to catch you. Finally, Mikie is on the schoolyard. Here some colleagues from the rugby team wait for him. When he has collected all his hearts, then he can go up to the exit, give the letter to his girlfriend and (hopefully) get the well-deserved kiss. 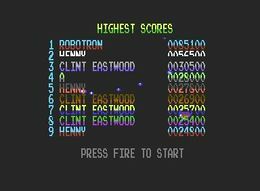 Perform the following actions in each level to earn 1000 points. Level 1 Walk up to the middle of the teacher's desk press Fire three times. Pick up all the white hearts to get another 1000 points. Level 2 Walk to the middle of the locker row at the top of the screen and press Fire three times. Level 3 Walk to the middle of the pop machine and press Fire three times. Level 4 Walk up to the left speaker and press Fire three times. Level 5 Walk to the middle of the lower left wall and press Fire three times. 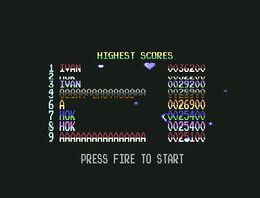 Robotron2084: "A really nice port of the arcade classic, which even beats the original in the field of playability and sound. Good work: 7 out of 10 points." Shakermaker303: "Nice thing. Was good to steer and with the music it was rather brisk. I always found the school cook a scream." 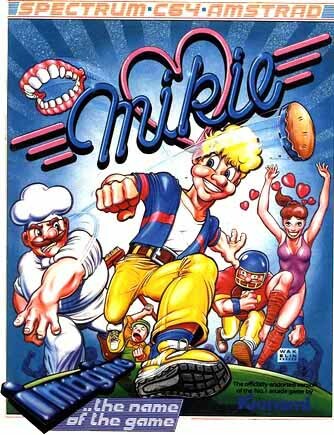 Mikie in the Killer List Of Videogames. This page was last modified on 8 March 2019, at 21:06.